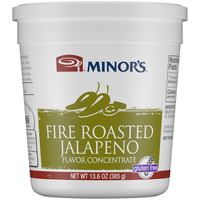 Minor's Fire Roasted Poblano Flavor Concentrate is a perfect paste combination of fire roasted poblano peppers, onions, garlic, cilantro and lime. Get the results of time-consuming methods such as roasting and caramelizing while saving time and labor in the chopping, seeding and milling of fresh ingredients. With a single flavor concentrate and commonly stocked pantry items, you can create dips, spreads, salad dressings, soups, marinades, sauces and even beverages. 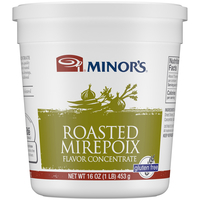 Minor's Roasted Poblano Flavor Concentrate delivers ease and consistency. Gluten Free. Vegetarian. No Artificial Flavors or Artificial Colors. 0 g Trans Fat per serving. 0 mg Cholesterol. Refrigerated to preserve freshness. Minor's is trusted by chefs with a rich heritage of bringing flavor to dishes and supporting the chef profession. 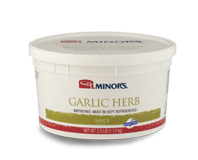 Minor's continues to pioneer innovation in foodservice as a full provider of flavors and foundations from bases to ready-to-use sauces. Storage Temperature: Keep Refrigerated. Shelf Life in Days: 365.